The newest inductees to the Southern Idaho Livestock Hall of Fame pose for a photo on April 9 in Twin Falls during the organization's 60th annual banquet. From left are Lou and Teresa Anderson with grandson Colter; Ed and Clarissa Brown; Harry and Vicki Hoogland; and Bob and Doris Naerebout. 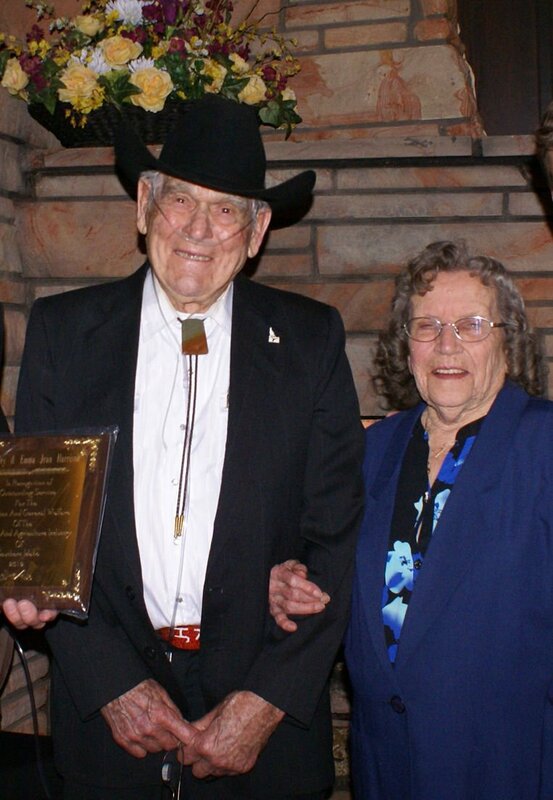 Hawley and Emma Jean Harrison pose for a photo after being inducted into the Southern Idaho Livestock Hall of Fame on April 9 in Twin Falls. TWIN FALLS — The Southern Idaho Livestock Hall of Fame honored its newest inductees Tuesday evening at the organization’s 60th annual banquet. The honorees are Lou and Teresa Andersen of Fairfield; Ed and Clarissa Brown of Gooding; Hawley and Emma Jean Harrison of Heyburn; Harry and Vicki Hoogland of Buhl; and Bob Naerebout of Twin Falls. The Andersens have built their beef cow herd to 700 head and own S&L Commodities providing organic hay and feedtsuffs to dairies in the western U.S. and Canada. Lou Andersen serves as president of the Idaho Organic Feed Growers Association, vice chairman of the Shoshone District Grazing Advisory Board and chairman of Water District 37B. He is also an advisory board member for Water District 37B Groundwater Association. Teresa Andersen serves as secretary of Water District 37B. The Andersens are also large supporters of their local 4-H program. The Browns run a beef cattle ranch and have been involved in training and showing horses and presenting horsemanship and colt-starting clinics. They have been active in the Gooding High School Rodeo Club and are funders of a Cowboy Church at the Gooding County Fairgrounds. The Harrisons have raised purebred Herefords since the 1960s and have been active in the National Hereford Association. They have served as 4-H leaders and local Grange officers. Hawley Harrison has served as a committee member for the Agricultural Stabilization and Conservation Service and Federal Housing Authority and has served as a director of the Minidoka Soil Conservation District, Idaho Cattle Association and Farm Credit Services. He holds an FFA American Farmer Degree and was named Grassman of the Year and nominated for Farmer of the Year in the same year. Emma Jean Harrison served as president of the Idaho Cattle Women’s Association and a director of the Idaho Cattle Association. She was appointed to the Idaho Beef Council and was a member of the Mini-Cassia Cowbells. She was named Idaho Cattle Association Woman of the Year and Farm Bureau Woman of the Year and received a Commendation of Distinguished Public Service to the Idaho Beef Council from then-governor Dirk Kempthorne. The Hooglands operate a 2,000-cow dairy and a dairy heifer ranch and are active in the Castleford FFA, holding honorary member status, and the Castleford Men’s Club, which provides scholarships to every Castleford High School graduate. Harry Hoogland was an original member of the Magic Valley Dairy Heifer Program and remains active in that program. Naerebout has served as executive director of the Idaho Dairymen’s Association, where he helped guide the establishment of a legal defense fund and a research foundation that with allied industry raised funds to partner with the University of Idaho to build a world-class research dairy. He also helped establish an environmental consulting division of the association to assist dairymen with sustainability. He now serves as director of regulatory affairs for IDA. He also serves as an advisor to Dairy Management, Inc., and on the executive committee of the National Immigration Forum Board of Directors and on the forum’s foundation board for America is Better. He also serves on National Milk Producers Foundation’s immigration task force and on the board of the Agriculture Coalition for Immigration Reform.